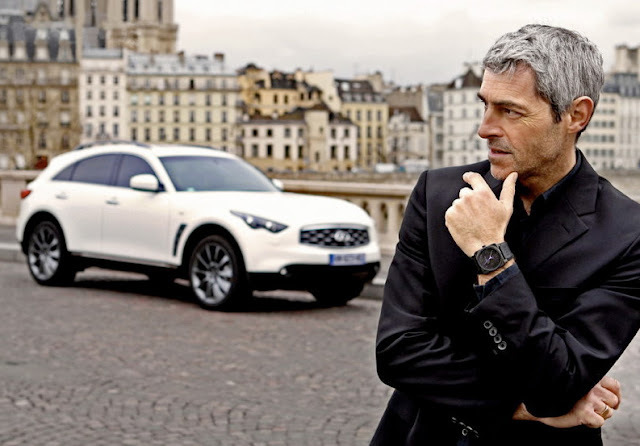 Luxury Car manufacturer Infiniti and French-Swiss watch brand Bell & Ross have collaborated on a limited edition timepiece. The special edition BR03-92 Phantom Instrument, designed by Bell & Ross, is to commemorate the recently revealed Infiniti FX Limited Edition performance crossover. 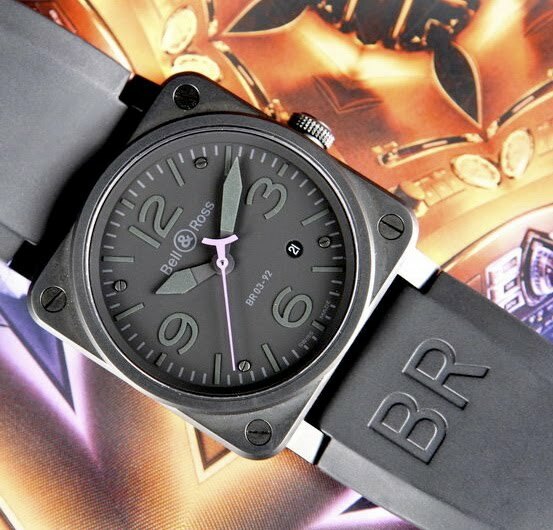 Only 100 of the individually numbered wristwatches will be available worldwide. Movement: Automatic mechanical ETA 2982. Functions: Hours, minutes and seconds (all central hands). Date with quick correction. 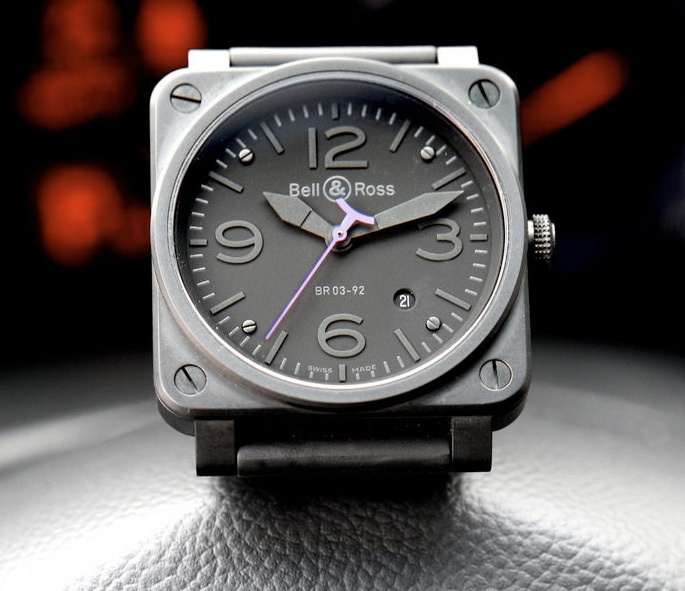 Case: Diameter 42mm, 316L glass bead blasted steel with black ‘carbon-powder coating’ finish, and winding crown. Back: Screw-down, stainless steel with engraving of the Infiniti signature and adjacent personalised limited edition serial number (1–100). Bell & Ross insignia etched below. Dial: Galvanic Black. Infiniti purple-coloured seconds hand. Numbers, indexes, and photoluminescent finish for optimal night reading. Circular window for date display. Water-resistance: 100 metres (10 bar). Straps: Heavy-duty synthetic black fabric or rubber. The launch of the exclusive timepiece, an elegant accessory for the discerning Infiniti customer and the watch collector, marks the collaboration of two brands which are synonymous across the globe with exceptional performance, craftsmanship, precision, and modern luxury. The special edition BR03-92 Phantom Instrument has been designed by Bell & Ross to commemorate the recently revealed Infiniti FX Limited Edition performance crossover, restricted, just like the watches, to only 100 individually-numbered examples worldwide. However, such has been the extensive demand prior to the release of the watch, that only a handful remain. The parallels from the fusion of Infiniti and Bell & Ross are clearly evident in the appearance of the piece. 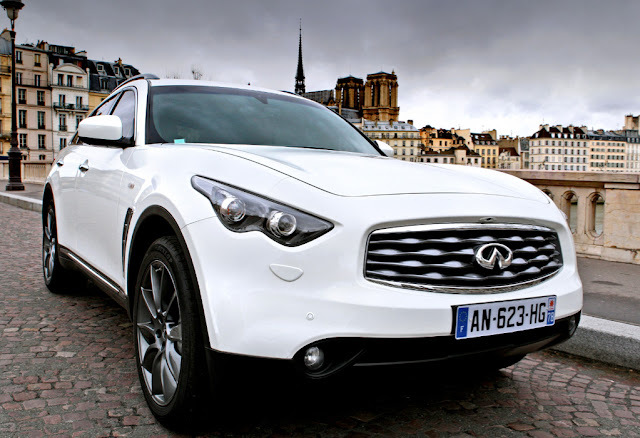 The black carbon powder finish, which encapsulates the 42 mm case, resembles the graphite finish applied to many exterior parts of the Infiniti FX Limited Edition and is just as beautifully-crafted. 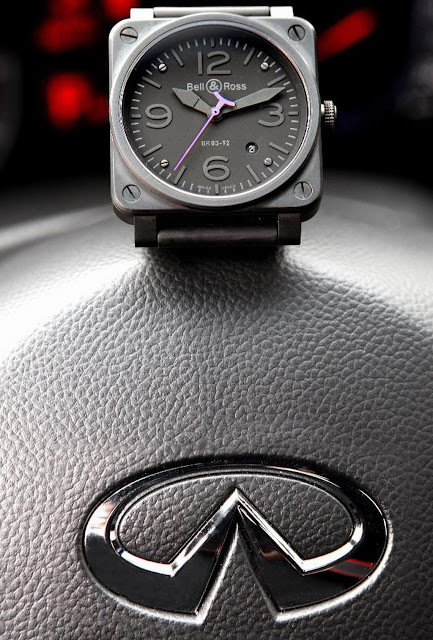 The seconds hand which sits on a galvanic black dial, is lined with a distinct purple coating, the same colour which lies at the heart of Infiniti’s brand identity, and can be seen everywhere from the instruments of the car to furnishings inside the Infiniti Centre. Whilst on the move, it is all about the ownership experience which is personal and exclusive: the rear of each the 100 pieces has been engraved with the Infiniti signature and is complemented by an individual number of the edition within the BR03-92 Instrument Phantom Infiniti series. 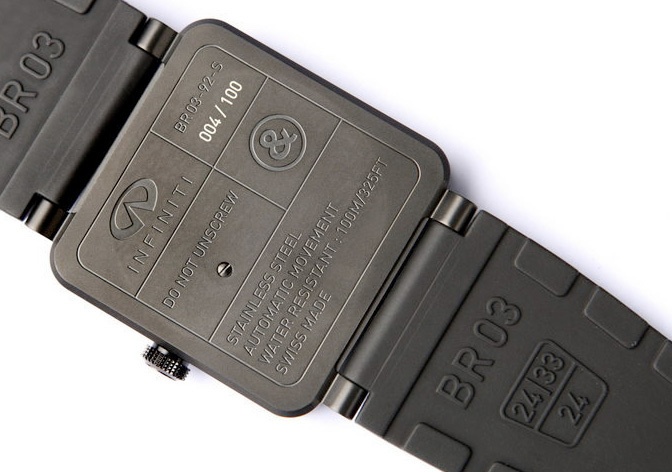 The BR03-92 Instrument Phantom Infiniti watch goes on sale on 01 June 2010 at a recommended retail price of €3,300, and is available for purchase from all European Infiniti Centres. For their locations which range from Barcelona to Bucharest, see www.infiniti.eu.